Get a taste of our latest pork rind recipe and all-things-crunchy blog. The holidays are a time to enjoy the ones you love. For us, there’s no better way to do that than with a good ol’ family dinner. This year, we’re taking our love of pork rinds and creating some delicious holiday recipes that’ll turn up your traditional family dinner. Stuffing: Ditch the bread and use Rudolph’s Original Pork Rinds as the base of your holiday stuffing. Toss sautéed onions and celery with crushed pork rinds, mix in your beaten eggs and chicken broth, and then pop it in the bird to bake. 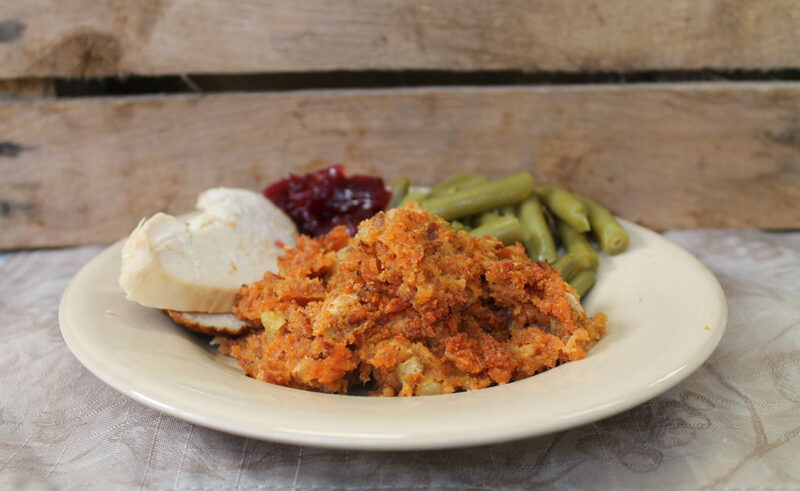 After trying this stuffing you’ll be wondering why you hadn’t made it sooner! Green Bean Casserole: Pump up this staple holiday side by mixing a 1/3 cup of Rudolph’s Hot and Spicy Pork Rinds with sautéed garlic, salt and olive oil for a crunchy topping. Pecan Pie in a Pork Rind Crust: And now for dessert, pecan pie anyone? Make a simple pork rinds crust by grinding up a bag of Rudolph’s Original Pork Rinds and mixing flour and eggs until it forms a dough. Place the dough in a pie pan and fill with your go-to pecan pie recipe. These surprising twists will have your friends ad family clamoring for more! Craving more down home meals? Head over to our Pinterest board with all the meals inspired by your Mama’s cooking! Calling all football fans! The Big Game (and Pork Rind Appreciation Day) is approaching and we think this year, you should win big! We’ve teamed up with the Gridiron Greats Assistance Fund to bring you the Pork Rind Appreciation Day game “Guess The Great.” Each time you play, you’ll be entered to win $2,500! Plus, a donation will be made to Gridiron Greats so they can continue to help the football legends we know and love. The game is simple, just match ’em and win! Everyday you play, your chance of winning it all increases! So next time you’re cheering on your favorite team, go to porkrindday.com during the commercial break and play to win. Huddle up and play “Guess The Great” today! We’re celebrating Pork Rind Appreciation Day with the Gridiron Greats Assistance Fund and you can WIN $2,500 too! For those who have never heard of the organization, Gridiron Greats Assistance Fund is Mike Ditka’s personal charity that provides medical and financial assistance to former National Football League (NFL) players in dire need. This year you can join Da’ Coach. Concussions and head injuries have had devastating effects on some of our favorite football greats. To bring awareness to the ailments affecting so many, we created the memory game, “Guess The Great,” to help raise awareness and also support Gridiron Greats. Each time you play “Guess The Great”, you’ll have a chance to win $2,500 and a donation will be made to Gridiron Greats. Play each day to increase your chances of being the grand champ. Test your memory, and play “Guess The Great” today! There’s no better way to enjoy fall sports than with a cold drink and some of the best tasting rinds around. Take a break from a basic brew and try out our Bloody Good Beer. It’s easy to make, and it combines the best parts of a Bloody Mary with your favorite beer. Nothing fancy, just been made better. Add 1/4 cup tomato juice, 1 Tsp. lime juice, a dash of hot sauce & Worcestershire sauce and a 12 oz lager to each glass. Wondering what to make with this delicious drink? 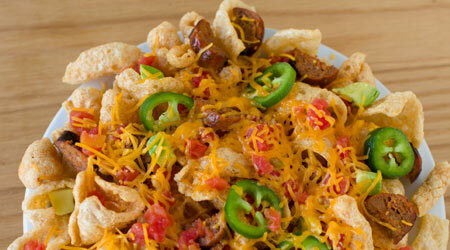 Add these pork rind recipes to your next tailgate to make it even better. Who doesn’t love a little competition? Well we’re pitting two monstrous nacho recipes against each other to find out which one will reign supreme. Let your gut guide you. Loaded Shredded Beef Nachos: In a skillet, layer Rudolph’s Pork Rinds with shredded beef, black beans, Pico de Gallo and cheddar and pepper jack cheeses. Place in the oven and bake until the cheese is melted. Serve with the toppings of your choice (though we suggest sour cream, jalapeños and guacamole). Arrange BBQ flavored Nachos in a dish. Top them with pulled pork cheddar cheese and barbeque sauce. Bake in the oven until the cheese is melted. Top them with jalapeños, cilantro and additional barbeque sauce. Go ahead and grab your rinds and whip up both of these man-sized nacho recipes. Remember, the messier the better. Let us know which one you think deserves to be crowned the champion! Our sixth annual Pork Rind Appreciation Day campaign in partnership with the Gridiron Greats Assistance Fund is officially underway! And this year, it’s bigger than ever. Celebrated on the biggest football day of the year, Super Bowl Sunday, Pork Rind Appreciation Day was cemented as an annual food holiday after you – our trusted pork rind fans – secured hundreds of thousands of votes back in 2010. Now through the “big game” on February 5, 2017, you’re invited to play Guess the Great, our newest memory game, at PorkRindDay.com. There, you can click and flip tiles until you find the tile with a matching Gridiron Great on the reverse side. Play Guess the Great as many times as you’d like! Each win will queue us to make a donation to the Gridiron Greats Assistance Fund. As well, a portion of the sale of each purchase of all Rudolph Foods’ products during the Pork Rind Appreciation Day season, including Southern Recipe, Southern Recipe Small Batch, Pepe’s Snacks and Lee’s Pig Skins, will support the Gridiron Greats Assistance Fund. But the biggest news for you? 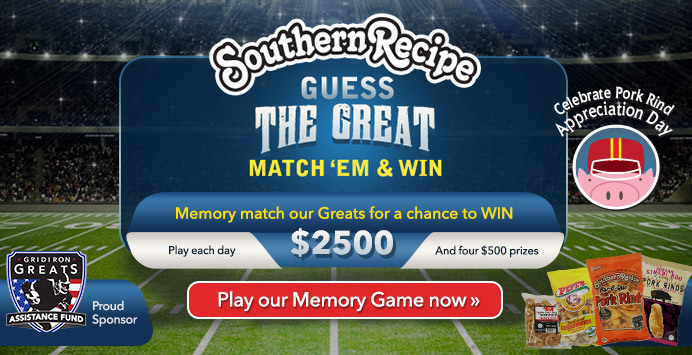 Each game win enters you to win $2,500 and a year’s supply of pork rinds from Southern Recipe. Four runners up will also win $500 and free pork rinds! How’s that for going big or going home? Play here. Play now. Play often and you could be $2,500 richer by February 5th! Whether you’ve been hunting on the same plot your whole life or you’re exploring some new territory, make this a season to remember. Just remember, when you come home pork rinds make a snack to unwind with and plan your next hunt! “This year marks the 52nd anniversary I will be going deer hunting with my dad and the 29th year with my kids. 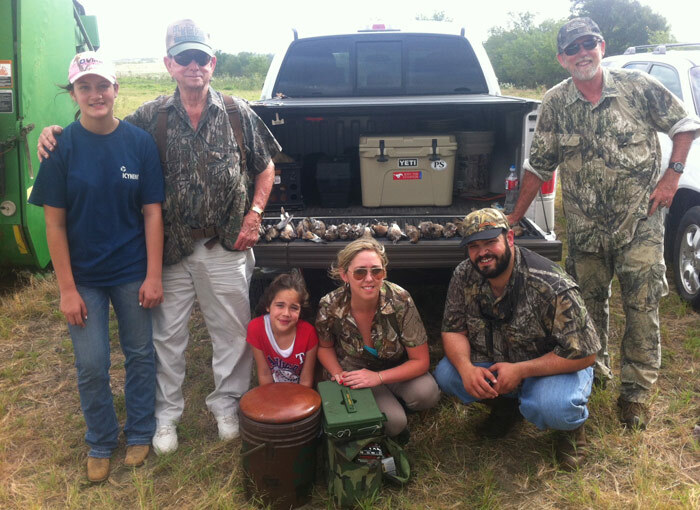 We have been hunting on the same lease in south Texas for more than 30 years. As my mom says, we are “making memories”. Find us on Facebook or Twitter to share your favorite hunting season memories! On October 16, we’ll celebrate World Food Day in an effort to raise awareness about the world hunger epidemic. Join us in spreading the word: Food is a basic human right just as pork rinds are a favorite Southern snack. On October 16, buy a bag of Rudolph’s Pork Rinds for yourself and snag another bag for a family member, a friend, a co-worker … or simply share it with someone who needs a pick-me-up! Tag us in a post using @RudolphFoods and #WorldFoodDay to show us just how much you care! Post a picture of you and your rind-loving pal and we’ll send you a bag of Rudolph’s! If there’s one thing we know, it’s rinds. And we’re no amateurs when it comes to cooking with ’em either. Here are our six food hacks for making the most of your rind time in the kitchen. Whether you’re making Sticky Cajun BBQ Pork Ribs with Buttered Pork Rinds or Smoked Meatloaf, stick with us and you’ll be a pork rind pro like us in no time. Make your bacon crispy without the clean up that a fry pan creates. Start by folding a sheet of aluminum foil accordion-style. Unfold the foil so the creases are still visible and then place on a baking sheet. Put the bacon on the foil rack and then cook in the oven at 400 degrees Fahrenheit until done. On game day, we all go through a couple bottles of beer, so if you need a little hair from the dog that bit you the morning after, reach for the leftover pickle juice and mix it right in. Your Bloody Mary has never been easier to make. When the craving for Chapaleles hits, you need potatoes that are as fresh as the day you bought them. To keep them from sprouting, toss an apple or two in the bag. If you’re a fan of spicy food … but your lips aren’t, use lip balm before you dig into another spicy plate of wings. Check to see how done your steak with a simple test that eliminates the need to slice into it. Lifehacker explains this revolutionary hack. Bacon is fatty, so it needs to be cooked slowly and at a low temperature. Render out most of the fat and leave your bacon crispy and golden brown by weaving the strips of meat in a basket pattern. Turn the oven at 400°F and cook for 17-20 minutes depending on the thickness of the bacon. The square pattern makes for a perfect layer of bacon to be added on your BLT. Thanks to Snapguide for this incredible recipe! Our BLT’s will never be the same … and neither will yours if you do this right! What happened to us, men? Trail mix used to be something guys would toss in their backpacks for a hike in the Rockies … or grab a handful to keep the energy high in the gym. Now? It’s all chocolate, candies and pretzels. Today, we take trail mix back! This trail mix has protein, crunch and heartiness unmatched by the mixes you buy at the store. 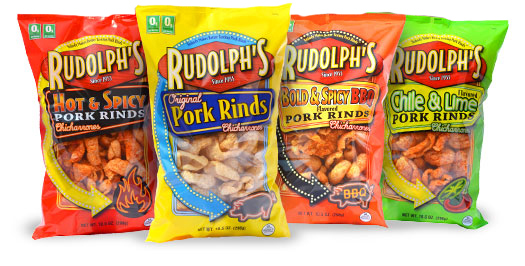 It’s all power and no fluff with the help of Rudolph’s Pork Rinds! In a small skillet, start melting butter. Add sunflower kernels and Worcestershire sauce. Fry until the butter starts cooking down and the sunflower kernels have absorbed most of the mix. Place nuts in large bowl. Pour butter/kernel mixture on the nuts and toss well. Spread coated mix on cookie sheet, and put in oven for about five minutes. While that’s cooking, in your large bowl, break pork rinds into smaller, bite-size pieces. Remove the nut mixture and use it to coat the broken up pork rinds. Spread the new mixture back onto the cookie sheet, and return to the oven. Cook for about another five to ten minutes, occasionally turning the ingredients as needed. Cool and store in a covered container. • Unlike potato or corn chips, pork rinds have no carbs at all! 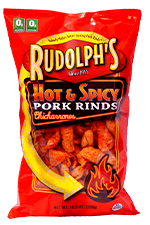 • Find Rudolph's Pork Rinds and Snacks on Facebook & Twitter! • Our hometown of Lima, Ohio is the Pork Rind Capital of the World. • Did you know? Pork rinds are President George H.W. Bush’s go-to snack!